DENVER – The Association of Corporate Counsel (ACC) announced today that Whirlpool Corporation and its outside counsel, Wheeler Trigg O'Donnell LLP, have been recognized as 2012 "ACC Value Champions" for their collaboration in making a difference for their organizations through creativity and value-based legal management skills. 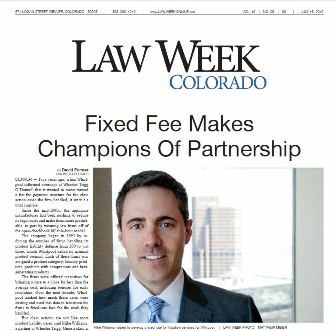 This new program, a component of the ACC Value Challenge, recognized five corporate law departments and seven law department/law firm collaborations that delivered substantial value to their client organizations by cutting spending, improving predictability, and achieving better legal outcomes. "'Improved predictability' and 'enhanced value' are the financial drivers behind our set-fee initiative with Wheeler Trigg & O'Donnell," explained David Grumbine, Senior Counsel and Director of Whirlpool's Dispute Resolution Operations. "Class actions present a major challenge due to the often unique nature of the litigation. Our fee arrangements have greatly improved cost predictability by using set-fee 'phase' billing and we enhance value by making the hours a firm invests equally as important to them as they are to us. A win/win." Emanating from success stories that ACC has witnessed in the continuing effort to ensure that client expectations – not hourly-based legal spend - drive the legal services equation, the 2012 ACC Value Champions' nomination process elicited significant initiatives that improved the cost efficiency of the legal function, both in-house and in partnership with outside counsel. "By coordinating efforts, Whirlpool Corporation and Wheeler Trigg O'Donnell LLP effectively aligned firm/client objectives and achieved a 40% savings on its class-action-defense program through a variety of tactics, including early resolution bonuses," noted Veta T. Richardson, President & CEO of ACC. "Their creativity and collaboration are great examples of best practices we hope other in-house counsel will learn from and replicate within their own departments." "The close relationship we have developed with Whirlpool over the past 10 years enables us to work efficiently together in defending Whirlpool's class actions," noted Michael Williams, WTO partner who leads the Whirlpool client team. "We have a strong and knowledgeable team of inside and outside counsel that keeps Whirlpool's best business and financial interests at the heart of every matter, which works to our mutual benefit." March 15, 2012. The 61 nominations, submitted by corporate law departments and law firm practice groups of all sizes and from around the world, were reviewed by a panel drawn from (more) the ACC Value Challenge Steering Committee, comprised of Jeffrey Carr, Senior Vice President, General Counsel & Secretary FMC Technologies, Inc., Elisa Garcia, Executive Vice President & General Counsel, Office Depot, Inc.; and Michael Roster, former General Counsel, Golden West Financial and Stanford University. The 2012 ACC Value Champions were selected for the significant results they achieved through management practices that could be replicated by corporate law departments, both large and small. The complete list of the 2012 ACC Value Champions, along with additional details and specific practices related to the Whirlpool Corporation/Wheeler Trigg O'Donnell LLP submission, can be viewed online at www.acc.com/valuechampions. Whirlpool Corporation is the world's leading manufacturer and marketer of major home appliances, with annual sales of approximately $19 billion in 2011, 68,000 employees, and 66 manufacturing and technology research centers around the world. The company markets Whirlpool, Maytag, KitchenAid, Jenn-Air, Amana, Brastemp, Consul, Bauknecht and other major brand names to consumers in nearly every country around the world. Additional information about the company can be found at whirlpoolcorp.com. The Association of Corporate Counsel (ACC) is a global bar association that promotes the common professional and business interests of in-house counsel who work for corporations, associations and other private-sector organizations through information, education, networking opportunities and advocacy initiatives. With more than 29,000 members in more than 75 countries, employed by over 10,000 organizations, ACC connects its members to the people and resources necessary for both personal and professional growth. By in-house counsel, for in-house counsel®. For more information, visit acc.com and follow ACC on Twitter twitter.com/ACCinhouse. Trial Tested® civil litigation firm Wheeler Trigg O'Donnell handles trials, appeals, arbitrations, and related areas of complex civil litigation, including class actions and multidistrict litigation, often as national or regional trial counsel, for professionals and many of the nation's best-known companies and organizations. WTO lawyers have tried cases to verdict in 45 states. WTO's class-action defense team has the depth and experience to try certified class actions anywhere in the United States. The firm has tried some of the largest class actions in the country during the past 10 years. WTO is the only law firm that serves as Whirlpool's national counsel for class-action matters.